I can’t believe it’s been two weeks since the worship night at ACTS Church in Tylorstown, Rhondda. The album artwork for Rob’s debut record - ‘Born to worship’ has been unveiled. Happy New Year Everybody! 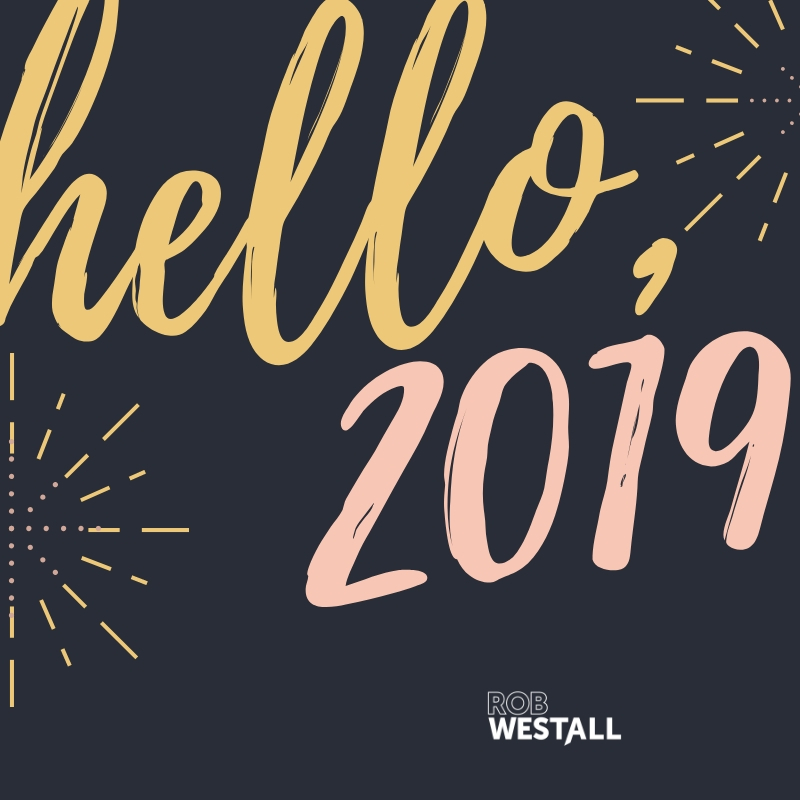 Just a short message of reflection and to wish you well for the year ahead! GIG ANNOUNCEMENT! Rob to play Rhondda! Rob Westall is to play a worship concert at ACTS Community Church in the Rhondda on Friday 25th January. Happy Christmas to everyone! I pray you experience “God with you” this festive season! An extra 40 tickets available for this Friday's gig! Rob Westall and band return to Gateway Church, Abergavenny, on Friday 9th November, for a special worship concert featuring special guest April Shipton. Gig announcement! Rob to play Chepstow Racecourse! We're excited to announce that Rob and his band will be playing Chepstow Racecourse next month on Sunday 2nd September. Rob, who has just returned from playing one of the biggest stages at one of the UK’s leading Christian music events - Creation Fest in Cornwall, will be playing the main stage at the world-famous Monmouthshire racecourse as part of the inaugural Wye Valley Food Festival. Held over two days, the free event, sees a wealth of food vendors, culinary masterclasses, family activities, funfair and live music starting on Saturday 1st September. Rob and the band will be on stage from 4pm. Rob says he is honoured by the opportunity to play at the event and is encouraging local churches to come together to support it. “The Wye Valley Food Festival is such an exciting new event with plenty of activities to keep families of all ages occupied,” he said. “Just looking at the quality of the food vendors, the masterclasses and the activities available, as well as the music, I’ve no doubt it will be a fantastic success. “I’m excited and honoured to have been asked to play the main stage on Sunday afternoon and think it’s fitting to have Christian music being played on a day where many people in this country gather together to worship. “At the moment, Christians in the UK are free to worship in public where others around the world are not. It is important we walk in the freedom we are given and many others around the world would love to have. Sold out! All tickets gone for Gateway gig! Tuesday’s worship concert at Gateway Church Abergavenny is officially a sell out! Thanks to everyone who bought tickets, donated and worked so hard to put this on ahead of Creation Fest UK! You guys and gals rock! Blown away by the love and support received. Thank you! Rob was well used to getting front page stories during his career as a journalist, now it's nice to see Rob hit the headlines for other reasons. 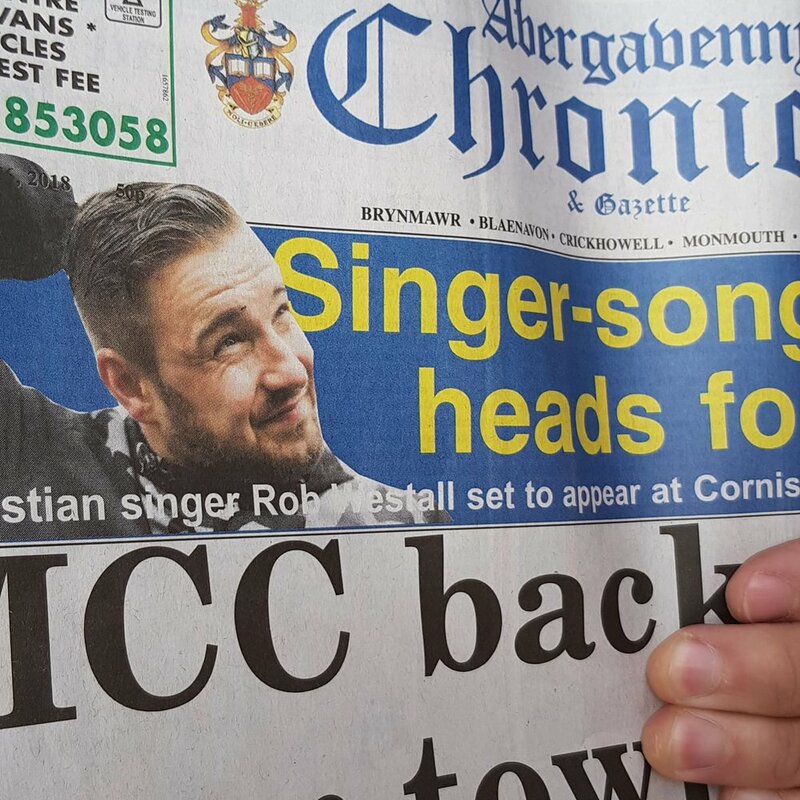 News of his forthcoming gigs at Creation Fest and Gateway Church were given the front page treatment today by Monmouthshire's biggest broadsheet -The Abergavenny Chronicle. Free CDs and digital downloads of one of the songs from Rob's album – How Great the Love – will be will be available for everyone who attends the ticketed event at Gateway Church, Abergavenny on Tuesday 7th August. So far over 100 tickets have been sold for the worship concert. 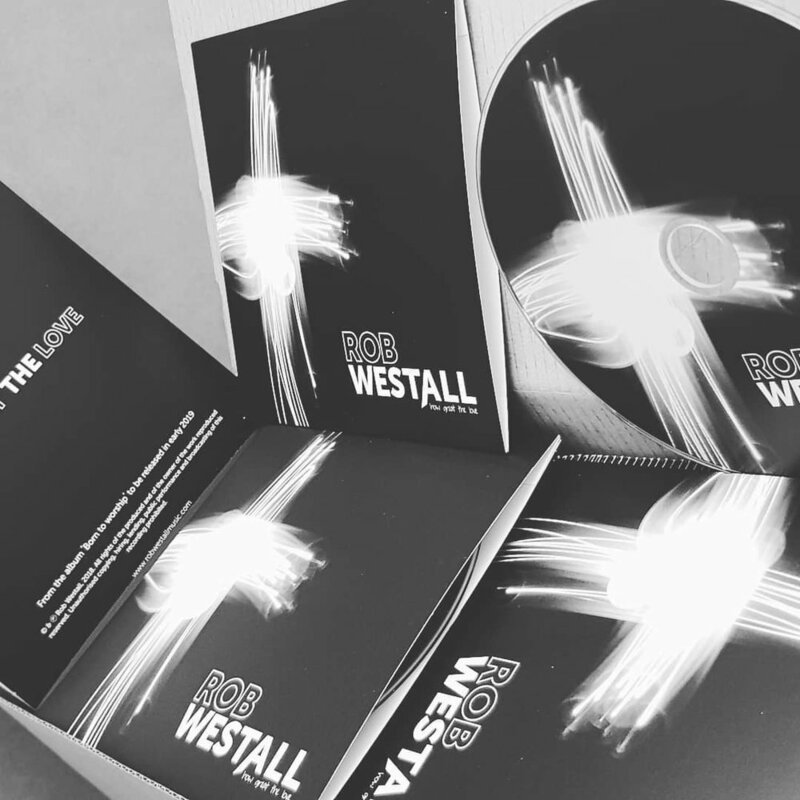 Doors open at 7.30pm and people can get tickets via Eventbrite: https://tinyurl.com/y7rw6rgx or by emailing info@robwestallmusic.com. Rob and his band will also be playing a worship concert at Gateway on Tuesday 7th August. The former Abergavenny Chronicle reporter will be playing a 45-minute set of self-penned songs which are regularly sung most Sundays at Gateway in Monk Street. All songs feature on his soon to be released debut contemporary Christian worship album, which he recorded with BAFTA nominated producer Gary White of Sync Tank Music at his state-of-the-art studio in Coed Morgan. 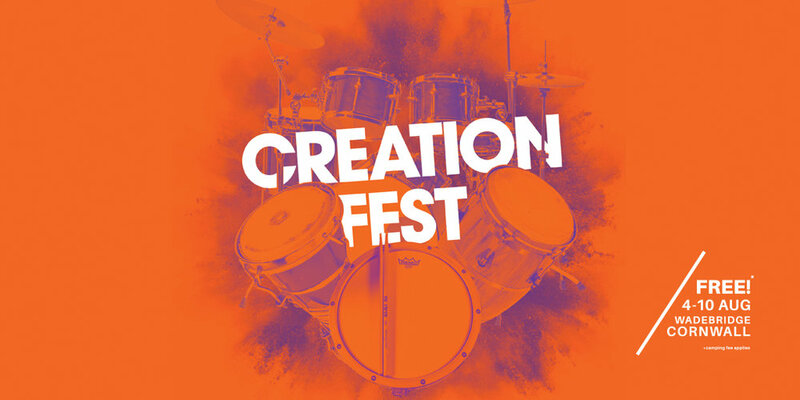 Rob and his band are delighted to have been invited to play this summer's Creation Fest 2018. The annual Christian festival runs from 4-10 August in Wadebridge, Cornwall. Entry is free and Rob and the band are due on the Big Top Stage at 5pm on Thursday 9th August. Rob will also be in the main hall throughout the festival, where you will be able to preorder his forthcoming worship album. Rob is to return to the studio to record the next two tracks of his debut worship album on Monday 7th August 2017. So far Rob has recorded eight tracks for the record which he hopes to release sometime in 2017/18. "I'm really excited to be heading into the studio once more," said Rob. "I can't wait to record 'At your feet we fall' in particular as it is a powerful song which always helps us go deeper into God's presence at Gateway. It is also my 4 year-old son Ben's favourite, so there's understandably been a lot of pressure to get it recorded next! "We will also be recording 'No More Tears (Glorious Day)' which was inspired a friend from church who sadly passed away last year. "I would like to thank everyone who is supporting my ministry in every way, without your support I would not have been able to get back into the studio so soon." Rob has been asked to lead worship at a charity evening in aid of Give Me Hope Africa in November. It will be a chance to hear about the great work the charity and God does in Uganda as well as hearing some of Rob's latest songs. The event takes place at Gateway Church, Abergavenny on Saturday 18th November 2017. For more information on this event and other please like and follow Rob on Facebook. Rob Westall has been added to the line-up of this year's I.Y.E Festival at Bailey Park in Abergavenny this Saturday (June 8th). The family event features entertainment from young and talented songwriters from the town, with workshops in song writing, beat boxing and theatre. Drama will be provided by The Covenant Players and there will also be giant board games and more. Rob will be rounding off the festival playing songs from his forthcoming album from 5:30pm on the main stage. Rob shared stories and songs from his forthcoming album with the congregation at Castle Street Church in Tredegar last night. Supported by his friend and multi-instrumentalist Andy Lovering, Rob led people young and old together in worship . . . and also enjoyed some delicious cake and tea served during the interval! A big thank you to the Rev. Steve Foley and everyone at Castle Street Church for making Rob and his team so welcome. Rob will be playing an acoustic gig at Castle Street Evangelical Congregational Church in Tredegar on Saturday June 3rd from 7pm. He will play two sets of songs featuring previews of 8 tracks from his debut worship album. Another two of Rob's songs were heard on BBC Radio Wales again this morning. It was the second of two BBC Radio Wales' Sunday Celebration programmes recorded at Gateway Church in Abergavenny. In January two songs from Rob's forthcoming album: 'Blessed Be' and 'Thank You Jesus' featured on the station and BBC iPlayer. This morning 'Be Lifted Higher' and 'Jesus Name Above All Names' could be heard sounding out on the airwaves. URGENT GIG NEWS - NOEL & TRICIA RICHARDS! Noel and Tricia Richards have sadly had to pull out of tonight's gig at Gateway Church in Abergavenny at the last minute due to ill health. Rob will play an extended acoustic worship set of his own original compositions for those who still want to come along. If you've bought tickets then a refund will be provided and entry is free on the door with refreshments provided.